The Santa Barbara International Film Festival will honor Academy Award® winning actor Geoffrey Rush with the Montecito Award at the 26th edition of the Festival, which runs January 27– February 6, 2011, it was announced today by SBIFF Executive Director Roger Durling. The Tribute will take place Monday, January 31, 2011, at the historic Arlington Theatre. The Montecito Award was created in recognition of a performer who has given a series of classic and standout performances in his/her career, and has previously been presented to Julianne Moore, Kate Winslet, Javier Bardem, Naomi Watts, and Annette Bening, who was the very first recipient in 2005. Geoffrey Rush stands tall within a rare and genuine class of actors, able to command the screen in each and every one of his roles. Ranging from the comedic to the dramatic, Rush’s vast and eclectic body of work illustrates him as one of Hollywood’s most versatile actors. 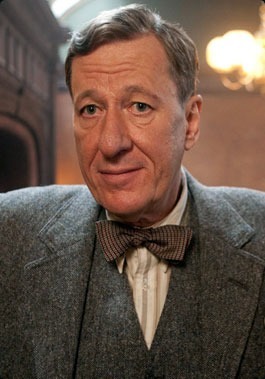 Geoffrey Rush’s most recent work includes his portrayal of Australian speech therapist Lionel Logue in the Tom Hooper film The King’s Speech. In the film, Lionel is recruited to help the man who would become King George VI (Colin Firth) get over his incredible stammer. Like his character in the film, Rush proves to be a true master of his craft, forging an incredible relationship with not only his pupil, but the audience itself. Rush made his big screen debut as a detective in the 1981 Australian film Hoodwink, and followed up the next year with a performance in the musical Starstruck. It was in 1996, however, that Rush really captured the attention of the world for his role as pianist David Helfgott in Shine. This role gained him an Academy Award for Best Actor and cemented him amongst Hollywood’s most elite. In 1998, Rush drew upon his vast theater experience to take on characters in three stage inspired films: as Javert in Les Miserables, as Sir Francis Walsingham in Elizabeth, and as Philip Henslowe in Shakespeare in Love for which he received an Academy Award nomination for Best Supporting Actor. The following year, he ventured into comedy as Casanova Frankenstein in Mystery Men and also horror as Stephen Price in House on Haunted Hill. Rush received another Academy nomination for Best Supporting Actor in 2000 for his performance as The Marquis de Sade in Quills. 2003 proved to be a momentous year for Rush, first venturing into the animated realm as Nigel in Disney Pixar’s smash success Finding Nemo. He then stepped into the career defining roles as the swashbuckling villain Captain Barbossa in Pirates of the Caribbean: Curse of the Black Pearl. Also that year, Rush starred alongside George Clooney and Catherine Zeta-Jones in the Coen Brothers film Intolerable Cruelty. In 2005 he went on to work with Stephen Spielberg, playing Mossad officer Ephraim in Munich. Soon after, Rush reprised his role as Captain Barbossa in the blockbuster films Pirates of the Caribbean: Dead Man’s Chest (2006) and Pirates of the Caribbean: At World’s End (2007). Before the release of The King’s Speech in 2010, Rush returned to voice acting in the animated film Legend of the Guardians: The Owls of Ga’Hoole. In 2011, Geoffrey Rush will once again assume the role of Captain Barbossa in the Disney’s fourth Pirates film: On Stranger Tides. The festivities will take place at the historic Arlington Theatre on Monday, January 31, 2011. Tickets for the Montecito Award are available now, discounted 20% until December 22 and can be purchased online or by calling 805-963-0023. Mini-Paks for the festival are currently discounted at 20%, while Festival Passes and Packages are currently discounted at 15% and on sale exclusively online and 805-963-0023. The Santa Barbara International Film Festival, presented by lynda.com, is set to run January 27 – February 6, 2011. Now in its 26th year, SBIFF is a non-profit organization dedicated to enriching local culture and raising consciousness of film as an art form and continues to be an essential stop on the road to the Oscars. SBIFF presents quality American Independent, Spanish and Latin American, European, World and Documentary cinema, as well as nature and surf films, all within the beautiful setting of downtown Santa Barbara, a perfect backdrop and premier tourist destination. SBIFF is also committed to education through its 10-10-10 youth filmmakers project, Field Trip to the Movies, and educational seminars. With a projected audience of over 70,000 viewing more than 200 films over its eleven-day run, SBIFF attracts an eclectic and diverse consumer base, both locally and nationally, while maintaining strong ties with the entertainment industry in nearby Los Angeles.